Love the concept of floating plants? LYFE's hovering planter consists of a pot that hovers on oak base via magnetic levitation and also rotates during the suspension. 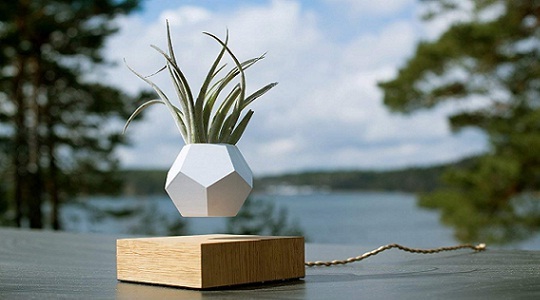 This zero gravity technology allows you to cultivate your favorite plants in mid-air. A 12 sided geodesic planter is molded from silicon which makes it grippy and tactile and while it rotates in mid-air, different shades appear providing a hypnotic and relaxing experience at your home or office. See your plant twirling in the air and feel the shades from various angles. It also takes care of slight overwatering by smoothly passing it through the cleverly designed inner drainage system. What makes this possible is its magnetic base where the strong electromagnetic field is generated, causing the planter to levitate in mid-air, lifting your planer to a new dimension.